By definition a ladder - is a construction design connecting the different levels of the room or area that allows a person to climb or descend, putting legs on the inclined plane, and on flat stages, which increases the convenience of this movement and its safety. However, not only this (and sometimes not this) function can perform the stairs. Or on the contrary, the same problem can solve the product on a classic staircase quite similar . 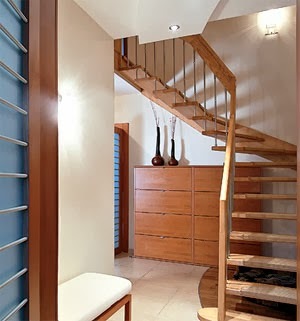 First of all, the view from the stairs depends on what point it connects: floors crowded room or floor to the bed of the second tier, on a gently sloping hill is in the garden or vertically to the attic. That appointment mainly determines the size, material and stairs design itself . Also affects them contingent of users for whom primarily designed staircase: apart from the usual "average" people, it may be children, disabled people, even animals. Furthermore, the imprint is applied strongest aesthetic requirements that exist (in a greater or lesser extent) in the creation of any design. 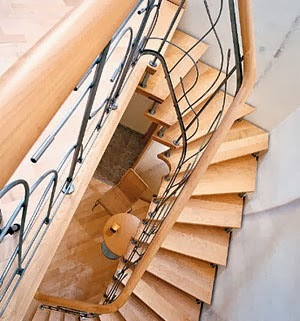 In the end, these requirements may be the main and only then there is a staircase will serve only a decorative feature. The most common can probably call FLOATING . But even they are transformed into something unique, if, for example, as a material to choose glass (and even with colored lights), or when the stage can be added, blending into a smooth exit, or, say, when a sort of decorative staircase (but quite normal size and forms) leads nowhere, as if proclaiming victory in the fight aesthetics with common sense . Screw, strings , etc. stairs originally meant originality and special design. Their very design contributes to the most unimaginable ideas. The use of appropriate materials and shapes makes it easy to fit them into the interior of any style - even techno, though baroque. Very unusual design of roof across (internal attic) stairs. Their main feature is that they are cleaned (they are too rarely used to stairs constantly occupied living space), but at the same time quite quickly and easily found in "combat readiness." Whole mass of such mechanisms can be divided into three major groups: fully retracts into the attic (the most simple, but require enough space on it), extendable (firefighters) and folding "accordion". The last two options, though more complicated in construction, but interesting in that their greatest section (when the rest retracted or folded into it) and can serve as an attic hatch - conveniently and economically. In a special section should include garden ladders (and other for open areas). As a rule, they perform a decorative feature (without quite possible to manage and even prevent transport) and therefore present only in expensive areas, comfortable in its class. Any hilly or sloping area can equalize (if used for growing potatoes). But the availability of funds and taste irregularities worth contrary to emphasize, emphasize using ladders. They may have only two or three low steps (by combining, for example, the levels of the main garden path and pergola or terrace and fountain), but once the garden will give volume, three-dimensional. Often occur conversion functions on the same ladder. For example, there was a decorative "nowhere", which housed (in artistic disorder) flowerpots and bookshelves. Following the acquisition of new furniture and overhaul of it did , ceiling spotlights which shine at angles 45 and 45 degrees thanks to the echelon form. Another case. Lost relevance outside leaning (but fixed permanently) stairs to the attic: a roof done a beautiful interior. But no one on the street is not going to dismantle on her perfect , it has become decorative. Or even the birth of a whole "sculptural ensemble." It began with that little puppy could not climb onto the porch (one step height of about 25cm). Arranged for him a miniature wooden (about a quarter of the width of the porch) ladder that breaks this height by 4 steps.She was so beautiful and so perfectly fit into the interior of the porch and veranda, and that after sprouting her dog not destroyed, but also built a smaller copy of the house (so stylized booth). Turned a sort of "sub space", as in a mirror in front of a mirror or on a monitor displaying the image of the camera, taking pictures ... Amazingly this monitor looks. Now, when you have free time ensemble gradually add details (also copied reality) - micro-well, micro-trees near the house, etc. It should be remembered that the same problem can be solved by a lot of different ways, but the most mundane objects in the presence of imagination and artistic taste can be turned into works of art.